Anatomy of an Anti-Tamil Pogrom: Thirty-fourth Anniversary of “Black July” 1983. The tragic history of post – independence Sri Lanka records that the Tamils of Sri Lanka have been subjected to mass –scale mob violence in the years 1956, 1958, 1977, 1981 and 1983. The anti-Tamil violence of July 1983 was the most terrible and horrible of them all. It remains etched in memory even after 30 years. Thirty -four years ago on the night of 23rd of July, members of the Liberation Tigers of Tamil Eelam (LTTE) ambushed an army patrol at the Post Box junction area in Thirunelvely in Jaffna and killed 13 soldiers. Troops went bersek in Jaffna in the hours that followed and shot dead 51 innocent civilians in the Jaffna Peninsula including 7 passengers in a minivan at Manipay. Some hours later on the Sunday that followed members of the Sri Lankan Navy ran riot in Trincomalee burning down Tamil houses and also forcibly relocating Tamil refugees. In Colombo the powers that be decided to publish, broadcast and televise the news about 13 soldiers being killed by the Tigers while blacking out reprisals by the armed forces. In an even more inflammatory move it was decided to stage a mass funeral for the dead soldiers at Kanatte. The situation took a violent turn and mobs began moving in the direction of Borella and Thimbirigasaya. Tamil homes and businesses were attacked and set on fire.As the Esala full moon shone brightly from a not so cloudy sky, clouds of smoke from burning Tamil establishments spiralled upwards. The following Monday 25th saw anti-Tamil violence spreading like wildfire. The plantation Tamil Patriarch Saumiyamoorthy Thondaman known for his pithy comments later described the violence that followed Poya on Sunday as – “Sunday Sil, Monday Kill”. The violence went on for three days peaking on Wednesday 27th and ebbing on Thursday 28th the day that Indian Prime Minister Indira Gandhi sent then Foreign minister P. Narasimmha Rao as her special emissary to Colombo. Friday 29th, saw Colombo and suburbs being terrified by the rumour that the Tigers had come to town. The afternoon of that fateful “Koti Dawasa” (tiger day) saw the goon squads massacring Tamils again after being “sure” that no tigers were in town. 30th and 31st July saw the violence diminish gradually. By August the violence had ceased as International opinion and pressure compelled the J.R. Jayawardene regime to “normalise” the situation. It is noteworthy that the nature of anti – Tamil violence was transformed after July 83. Incidents of massive mob violence ceased although isolated sporadic incidents did occur but were quickly crushed by the authorities. It has been often said that the mob violence of 1983 has not been repeated which indicates that the “Sinhala people” who perpetrated those acts have learnt their lessons. There are many references to the “tolerance and greatness of the Sinhala people in not enacting another July 1983″ in this discourse. What should have been the “norm” is being depicted as the “exception”. Some strongly emphasise that “Black July 83″ will never ever happen again. Not all Tamil victims of that violent spree are convinced and many do have apprehensions of a repeat performance. The main if not the only reason for the absence of large-scale mob violence after 1983 was the escalation of the war . Anti – Tamil violence was institutionalised and legitimised as an integral component of the war. With the pre-dominantly Sinhala armed forces engaging in full – scale war there was no need for lesser forces to act on their own. Also the events of July 83 paled into insignificance as incidents of a more terrible nature proliferated in the North and East under the aegis of war. If July 83 was a week long episode the war was constant and continuous victimising and displacing the Tamil people in their historical habitat. It is possible that a section of the people who were non –participants may have been supportive of the anti – Tamil violence and sanctioned it by their silence. But the majority of the Sinhala people were against what happened then. It cannot be forgotten that a large number of Sinhalese protected and saved Tamils often at great personal risk. The second and more important point to note is that the July 1983 violence was not spontaneous in its entirety. It was basically an organized act. Several persons may have engaged in the violence on their own but there were core groups at different locations that planned and executed it. As is the case in mob violence these core groups were joined by others.These groups had absolute impunity and had the protection of important members of the United National Party (UNP) Government then in power. The mobs had lists of Tamil owned houses and businesses. They also knew the details of ownership. 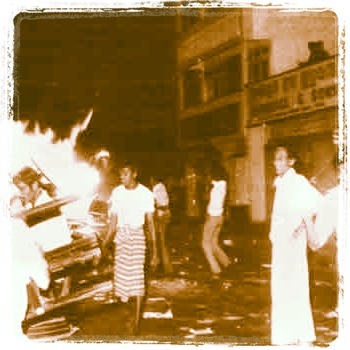 Wherever premises were owned by Sinhalese, only furniture and goods belonging to Tamil tenants were destroyed and set on fire. The buildings were not burnt or damaged. Many of the mobs were led by functionaries of the UNP trade union Jathika Sevaka Sangamaya (JSS). Several UNP municipal and urban councillors were involved. Many prominent supporters and strong – arm men of cabinet ministers were involved. The Police were ordered by UNP politicians not to arrest the violent elements. In most instances the large groups of thugs and goondas were transported in Government owned Transport board vehicles or in vehicles owned by semi-govt corporations. Even food parcels and liquor were distributed systematically to these elements. When some decent UNP leaders like Shelton Ranarajah and Renuka Herath Ranasinghe got goons locked up by the Police in Kandy and Nuwara – Eliya respectively their release was secured by Cyril Mathew and Gamini Dissanayake. The role of Cyril Mathew and his political lackeys in the violence are well –known. Some of those involved are still in politics and holding high office. What happened in July 1983 was not a spontaneous riot but a planned pogrom. A “Pogrom” is defined as a form of violent riot , a mob attack, either approved or condoned by government or military authorities, directed against a particular group, whether ethnic, religious, or other, and characterized by killings and destruction of their homes, businesses, property and religious centers. The word pogrom is of Russian origin and means “to destroy, to wreak havoc, to demolish violently” in the language. Pogrom became commonly used in English after a large-scale wave of anti-Jewish riots swept through south-western Imperial Russia encompassing present-day Ukraine and Poland from 1881-1884. Later more bloodier waves of pogroms broke out from 1903–1906, leaving thousands of Jews dead and wounded. What happened in July 1983 was a pre-planned conspiracy to launch a widespread attack against Tamil life, limb and property on a massive scale. All it required was a powerful incident to be the provocative pretext to justify such an attack. The Thirunelvely attack by the LTTE killing 13 soldiers provided such an excuse of being the flashpoint of tension. It is also noteworthy that violence against Tamils had preceded July 83 in Vavuniya, Trincomalee and the University at Peradeniya. July 83 in that sense was a grand finale or culmination of an on –going process. 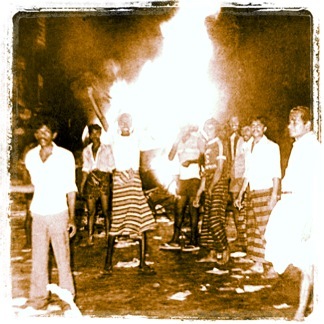 It is clear therefore that in spite of the attempts to rationalise the July 1983 anti-Tamil violence as a “Sinhala backlash to 13 Soldiers being killed by Tamil Tigers” evidence uncovered during the past years have proved conclusively that “Black July” 1983 was a definite Pogrom and not a spontaneous reaction of the Sinhalese. Notwithstanding the efforts of then President Jayawardene to tarnish the Sinhala people as being collectively responsible for this carnage, respected observers such as Paul Sieghart of the International Commission of Jurists exposed the real state of affairs.As Sieghart himself points out in his report (Sri Lanka: A Mounting Tragedy of Errors) “Clearly this (July 1983 attack) was no spontaneous upsurge of communal hatred among the Sinhala people – nor was it as has been suggested in some quarters, a popular response to the killing of 13 soldiers in an ambush the previous day by Tamil Tigers, which was not even reported in the newspapers until the riots began. It was a series of deliberate acts, executed in accordance with a concerted plan, conceived and organized well in advance”. Black July 83 saw over 4000 Tamils and a few Muslims mistaken for Tamils being killed. Thousands were injured. Some of the injured were killed in hospitals. There were over 200,000 displaced persons as a result. 130,000 were housed in makeshift refugee camps. More than 2500 business enterprises ranging from factories to petty boutiques were damaged or destroyed. The number of houses and dwellings damaged or destroyed is not fully estimated. The rationale behind the Tamil homeland demand was demonstrated once again. While it was emphasised that Sri Lanka belongs to all her people and no community could claim exclusive rights to any part of the country , July 1983 resulted in the Tamils being cruelly denied existence in the Southern provinces. The victimised Tamils were sent to the North and East for safety thus proving the necessity for a safe haven in the North and East. This is what impelled former opposition leader Appapillai Amirthalingam to state that the uppermost issues for Tamils then were the “security of our people” and “integrity of our homeland”. The same Amirthalingam was asked by the Ven.Walpola Rahula Thero at the all-party conference what problems were faced by the Tamils in Sri Lanka. Amirthalingam responded sorrowfully “How can you ask this question even after July 1983″? The mass scale deaths, destruction, displacement, deprivation and despair suffered by the Tamils both Sri Lankan and Indian made them characterise those days in July as a dark period in their life. The extent to which the Tamils were diminished in that month made them call it “Black July”. The Tamil people were at a nadir of despondency. When writing about “Black July” one is conscious of the negative connotations in using the colour “black” to describe something bad and evil and the colour white for pure and good. In this age of “political Correctness” these usages have been challenged and debunked as insidious vestiges of racism. Wittingly and unwittingly these usages keep promoting racist stereotypes of colour. Nevertheless it is difficult to adopt such a politically correct stance in the Sri Lankan context as the description “Black July” has pervaded national consciousness. Avoiding such reference would be particularly impossible in writing about the developments of July 1983. “Black July” also denoted a decisive shift in the politics of the Island. The bulk of the people affected in the violence were Tamils living outside the Northern and Eastern Provinces. With their hopes of living peacefully amidst the Sinhala people being blasted their future seemed bleak. Two trends started. One group of Tamils started relocating to the North and East. Another group migrated abroad mainly as refugees. As the War escalated, expanded and enveloped the North and East Tamil People started moving out of the Island in even greater numbers. The July 1983 pogrom saw more than a hundred thousand people fleeing to India as refugees thereby providing that Country with the necessary “locus standi” to intervene politically in Sri Lankan affairs. India also encouraged the training and arming of Tamil youths. Thousands of youngsters flocked to the different militant movements. Thanks to the 6th amendment to the Constitution the Tamil Parliamentarians of the Tamil United Liberation Front (TULF) also kept away thereby losing their seats. The political leadership began passing slowly and surely into the militant youth hands. The economy of Sri Lanka was affected badly. The good name of the country was sullied irreparably. The trend of relocating to Western nations continued for many years as the war escalated. The Global Tamil Diaspora financed and fuelled the Tamil militant movements including the LTTE. The Tigers set up overseas structures that function even today. One of the lamentable features of that Pogrom was the abominable response of JRJ and senior ministers on Television. Not even one word was uttered in sympathy for the victims of the violence. 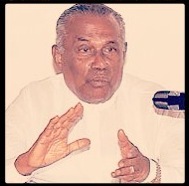 JR indirectly blamed the Sinhala people and said it was a natural reaction. Instead of reaching out to the victimised Tamil people the President announced that legislation would be brought to forbid secessionism. State minister Anandatissa de Alwis spoke about a hidden hand, a foreign hand being responsible. He said there was a conspiracy to provoke clashes between the Sinhalese and Tamils, the Sinhalese and Muslims and Buddhists and Christians. Lands and Mahaweli development minister Gamini Dissanayake warned Tamils that it would require 14 hours for Indian troops to come and rescue them but the Sinhalese could destroy them in 14 minutes if they wanted to. Trade minister Lalith Athulathmudali was sorry that people had to queue up again for essentials as a result of the violence. Finance minister Ronnie de Mel gave a lecture in history about the horse traders Sena and Guttiga. Cyril Mathew the industrious minister of anti – Tamil affairs raised the Indian bogey and saw an alien hand behind the conspiracy that led to the July 83 violence. His cabinet colleague Saumiyamoorthy Thondaman refuted it and said elements inside or close to the govt were responsible. Black July 83 was a watershed in the contemporary history of the Island. Black July 83 aroused the conscience of many Sinhala people. Indeed it cannot be forgotten that a great deal of Tamils escaped danger only because of the courageous protection extended by their Sinhala friends. There were well meaning efforts by several persons to make amends and reach out to Tamils.Notable among which were the initiatives taken by the Anglican Bishop of Kurunegala. Rt. Rev. Lakshman Wickremasinghe and Methodist Church President Rev. Soma Perera. But as time progressed the ruling elite was able to prosecute the war against the Tamils further. Gradually the pangs of remorse and guilt felt by Sinhala public opinion about July 83 became lesser and lesser. Furthermore an insidious campaign resulted in changing and undermining the significance of Black July 83. This campaign was two fold. Firstly the scope as well as the original implication of Black July was altered. The past years have seen July being depicted as “Black” not for the 1983 anti Tamil Pogrom but for all the “bad” things that happened in July. The list was endless ranging from the 1987 Indo-Lanka accord to all acts of violence in July. Thus July was made to be “black” because of the large number of violent incidents that occurred in that month. The original significance of it being called “Black July” to mark the horrible pogrom against the Tamils was systematically diluted. Historical revisionists may even obliterate this “original sin” and substitute some other event as being the cause for July becoming Black. Thereby the long term “guilt” effect of the anti Tamil holocaust of 1983 July on the Sinhala psyche would be alleviated perhaps eradicated in time to come. The second aspect of this campaign was the demonising of a perceived LTTE threat. The July 1983 violence as well as the phenomenon of Captain Miller, the first Black Tiger, embracing death on July 5th 1987 were used in a cunning roundabout way. The line trotted out was that the LTTE considered July as “Black” enough to warrant the perpetration of some terrible act of violence as symbolic defiance. So we saw the media being inundated with stories of how the security forces were geared up to face threats to the nation because the Tigers wanted to take revenge for Black July. The whole security apparatus is placed on a red alert it was said. Any relatively minor incident of violence by the LTTE in July was attributed to the Black July syndrome. After July passed , a collective sigh of relief was released. With the spectre of Black July behind it the nation strode boldly and confidently forward until of course the next evil “black July”. Each year saw this comical ritual being enacted faithfully. This annual “black July” scare helped each year to divert focus away from the remembering of the Black July 1983 pogrom against Tamils. Instead of letting the Nation recall this terrible act with remorse, the spotlight was beamed on an imaginary threat from the LTTE.This helped reverse roles. The nation at large was perceived as “victims” because they were considered vulnerable to a diabolical LTTE threat because of “black July”. The perception of Black July was distorted. Instead of being portrayed as the month denoting the pogrom against the Tamils “Black July” was now the month where the nation particularly the Sinhala majority was perceived to be cruelly vulnerable to LTTE violence. The negative result of this campaign was the undermining and distortion of the significance of July 1983. Signs of blaming the victim syndrome were also visible. But then there is always May 2009. The Rajapaksa regime tried to project that month as victory month over the LTTE . But there were thousands of civilians who were killed, injured or disappeared in that month. So to a large number of Tamil people May 2009 is “Black May 2009 ” like “Black” July 1983. Under these circumstances there is a possibility that the significance of Black July may decrease gradually. We are told nowadays that there are no minorities in this country. We are advised to forget the sordid past and look to the future. Remembering the past is depicted as unwanted and unnecessary in the current climate. The July 1983 anti – Tamil pogrom is fading into distant memory. The inherent danger in the pogrom of July 1983 being forgotten is that it may very well happen again. As the truism goes “those who do not remember the lessons of history are condemned to relive it again”. Arguably had the memory of 1958 anti – Tamil violence been frequently re-visited the incidents of 1977 and 1983 may not have recurred. A major demographic change of vast political significance is the phenomenon of about a million Tamils relocating to the areas outside the North and East in recent times. Politically this had been a major obstacle to the Tamil separatist cause. Here were people electing to live in “enemy” areas even as a bitter armed struggle was being launched in the North and East on the rationale that coexistence was not possible. But this point is lost on the new spectre that is emerging in the South. The ugly head of neo fascism masquerading as patriotism is being raised. The Tamil people in particular and the minorities in general are being pilloried as “aliens” and “visitors”. “Ethno Religious Fascism”is on the rise. The purveyors of racial hatred are spreading their evil gospel and irresponsible sections of the media are peddling it regularly. Communalist propaganda in the garb of pseudo nationalism is gaining ground. The LTTE is no more but the Tamil population remains. They are seen as being relatively well –off or enjoying better standards of living compared to the lumpen elements in urban, semi –urban areas. Also the economic peace dividends expected by the ordinary people are yet to percolate downwards. Equally disturbing is the hate campaign conducted against religious minorities such as Muslims and Christians. The organizations responsible for attacks against Islamic and Christian places of worship operate in a climate of impunity with the sanction of some powerful individuals in the upper echelons of the ruling establishment. Against that backdrop a communal conflagration cannot be ruled out decisively. Neo-fascism and pseudo-nationalim require the discovery of new enemies constantly. After the Holocaust of the Hitlerian era and its impact on the European Collective psyche, few would have expected fascism or neo Nazism to resurface. Yet many European Nations including Germany,France.Austria and Netherlands are experiencing it now. All people of this land striving for a decent and humane future would hope that the July 1983 pogrom was only an aberration. But as in the case of eternal vigilance being a prerequisite for maintaining perennial liberty, constant rekindling of the tragic memories of “Black July 1983″ is very necessary to prevent repetition. « Manhunt Launched in North for Killer of Policeman in Jaffna Shooting Incident; Suspect Identified as 39 Year old Ex-Tiger Selvarasa Jeyanthan of Nallur.